The first walk which one should describe in Naxos is what has become a traditional stroll at the Palatia or Portara or Apollo Temple or the Baths of Ariadne: that is on the islet in front of the harbour which you spot as soon as you arrive in Naxos, as the huge marble gate, the Portara captures your eye. 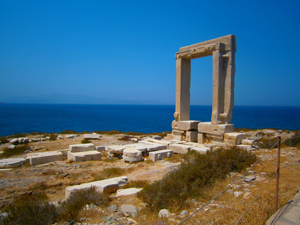 This is a very popular walk with the many tourists who come in Naxos. It is known that in the intervening period between antiquity and today the level of the Mediterranean has risen significantly and, consequently, the low lying parts of what where coastal areas in ancient times have been covered by the sea. So it would seem that the Palatia islet was once a hill, lower than that of the "Kastro", rising from a more extensive coastal plain. In the 3rd millennium BC there was a settlement near the islet and it is conjectured that the Palatia was the Acropolis of this Cycladic village. The area was subsequently deserted for many centuries. All we can see today are the foundations and the huge portal of the "hundred foot" temple begun around 530 BC by Lygdamis, tyrant of Naxos, but never completed. The "Portara" was built with four blocks of marble, each of a length of over 6 metres and weighing 20 tones. Winches and scaffolding were used to put them in place. The threshold of the portal is higher than the floor of the temple, a phenomenon who occurs elsewhere only in the case of the temple of "Twin" Apollo at Miletus. The temple was planned to be rectangular with pillars on the two short sides. 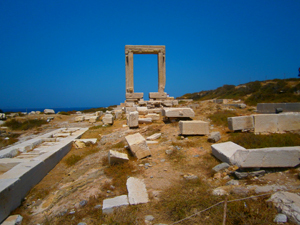 The Portara exactly faces Delos and this is seen as a reference to Apollo, the temple being identified as the Delion (temple of Delian Apollo), although some scholars associate it with Dionysus, on the grounds that Naxos was the birthplace of Bacchus and the island where Theseus left Ariadne inconsolable, until she obtained the protection of Dionysus. In the 6th century BC the Palatia served as good stronghold near the town and it was there ,it seems, that the Erythraeans and the Milesians established themselves in one of their attacks on Naxos. However, a noble Naxiot lady, Polycrite, whom the leader of the Erythraeans had fallen in love with and carried off, sent a message from the enemy camp to her brothers, informing them of the day on which the enemy would celebrate the Thargelia (a festival in honour of Apollo) by baking a lead tablet in a loaf of bread. 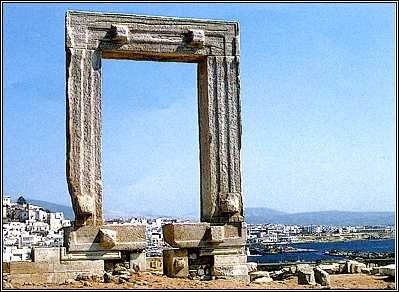 Thus Naxos was saved. The Palatia temple was converted into a Christian church in the 5th or 6th century AD. Under Frankish rule a great deal of marble was removed for building in the Kastro area. This destruction continued under the Turks, with the result that only the foundations remained, together with the "Portara", which was so big that they did not have the means to demolish it. Apart from its historical and archeological significance, the islet of Palatia is unique in the Aegean as a spot from which to enjoy the sunset and gaze at Paros and, when the horizon is clear, Delos, Mykonos and Syros.